The cookout and sleep-out are special traditions at Camp Riverlea. Children experience camp beyond the regular day and enjoy dinner, games, the magic ring ceremony, and a night under the stars. The cookout takes place every session, and in sessions 1 and 3 it is followed by a sleep-out. Campers who are in the Trolls group (rising 4th graders) and older are invited to spend the night at Riverlea. The cookout and sleep out are for campers only. An e-mail with the information below will be sent out at the beginning of the week of the cookout and/or sleep-out. We will also send out a permission slip and transportation information form, where you can indicate whether you want to pick your child up at camp or if they should ride the bus. We strive for 100% attendance at these events. Session 1 cookout and sleep-out: Thursday June 27 – Friday June 28, 2019. Session 3 cookout and sleep-out: Thursday August 1 – Friday August 2, 2019. All campers are invited to stay at camp until 7:45 pm for the cookout and Magic Ring Ceremony. At that time, all Hobbits, Baggins, Dobbers, and Pippins (campers going into 3rd grade and younger) will be sent home, and all Trolls, Tooks, Ents, and Striders (campers going into 4th grade and older) are invited to stay the night at camp. 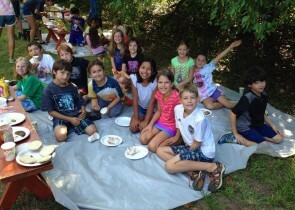 Hamburgers, veggie burgers, hot dogs, carrots, chips, and s’mores are provided for dinner, and breakfast and lunch are provided for campers who spend the night. There is no additional cost for these programs. Session 2 cookout: Thursday July 18, 2019. 7:45-10 overnight program. The times change, but the activities include: big game of capture the flag; plunge in the pool; changing into sleepwear; campfire program; luminary ceremony; dance party; lights out. Have more questions? Maybe they are answered here.